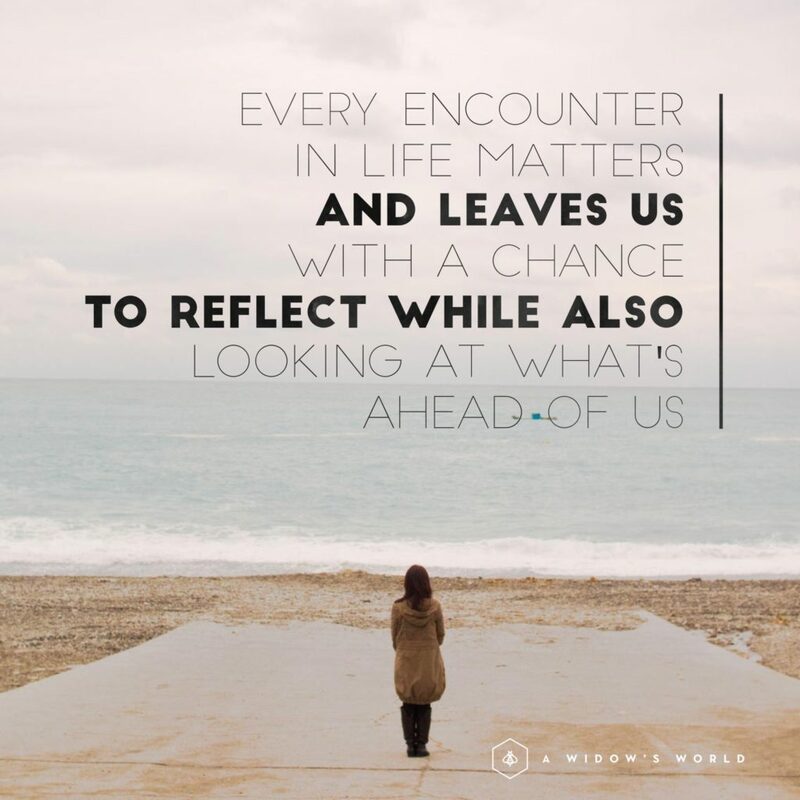 Every encounter in life matters. Every encounter leaves us with a chance to reflect looking at where we have been, where we are now and where we want to be! I have had several encounters over the last couple weeks that really allowed me to stop and look back at my former broken self and see where I am today. The biggest thing I have seen lately is how so many things are being revealed to me. It is because I have opened my heart, my mind and I have been praying more directly. When my my first husband John passed away, I was working for a wonderful company. They were sensitive, supportive, and understanding of the tragedy I had gone through. The week following Johns passing, we were supposed to be on a trip to Vail, Colorado with everyone. A trip that I had planned and John and I were very excited about. Needless to say, we did not get to go on that trip and all of our plans we had would never happen. I went back to work a week and a half later, because I had to financially. Though it was hard, it helped focus my mind on something that I knew, my job. I had so many moments I would be crying in my office. I felt broken and afraid of what my future was going to be. I was lost without my partner and best friend. I felt bad for my family, friends and co-workers who had to see me that way, even though I knew they understood. I eventually made the hard decision to leave and take time off to find me, the new me. I had sold our lot that we were going to build on and so I had a little money to take me through a few months time while I waitressed, until I figured things out. I closed a chapter that I needed to close at that time to start writing a new one. It was the right decision for me. Recently, my old co-workers reached out to catch up. As I was walking into the building emotions started flooding over me. I continued through the lobby and saw my old office. As I waited for some of them to greet me, I had a moment that made me stand still and stare into the office window. I could see my former self, sitting there so frail, beyond devastated and lost. I was the most lifeless version of myself at that point in time. So uncertain of what my life would be. I immediately turned back to where I am now. Feelings of thanks and pride washed over me. If anyone had told me I would get through it back then and have the life I have now, I truly would not have believed it. It was not without struggles, I struggle to this day. Looking at myself today, I was standing in that same spot but now I was a strong, confident woman. I was remarried, had two beautiful daughters and I had built an amazing career. I saw someone who didn’t take no for an answer and it showed in many areas of my life. I now carried a smile and an evident love for life. There will always be an underlying sadness behind my smile, but I am happy in my heart. Happiness is knowing John would be happy for me too. Message: Remember to take care of yourself. Listen to what you need and not what others think you need. Take time for your heart to heal. It will take years and years. Parts of my heart are healing still. It won’t heal completely and your hurt will always be there, but listen to yourself and what you need to move forward. Allow yourself the chance to at some point in time stop and look back with pride for how far you have come. The next line brought me to instant tears, “I knew your husband, John, I was friends with him and also know your dad.” I quickly apologize for my tears which maybe even were sobs….yes sobs. See, even ten years later, unprepared for running into someone, I did not have my guard up. I was not prepared. I immediately felt bad and said, “I am so sorry, I do this sometimes, I am OK.” His family was staring in shock and I quickly recognized that everyone was looking at me, thinking why is this woman crying in the ketchup and pickle isle. I pull myself together and hear him say, “Be blessed.” This encounter completely shook me. I always have outwardly been strong and wore my smile. I broke down. I had let myself break down and show my true feelings, the sadness of losing John, it will always be there. Most people that know me, will say that I am very open and almost transparent when it comes to how I am feeling. This is true, but I have held a lock on my heart, ever since John passed away. I locked up space, that I let no one see, because it is hard. I have been opening up this space, because I’m ready to. Sharing has been beyond amazing for me, I always wanted to do this, but I had to be ready. The timeline is mine and no one else’s. After, I left the store I instantly wished I would have been able in that moment to have a conversation with this man, to let him know that even though I showed my tears, my sobs…I am good. I am good within my self, I am good within my soul and I am so proud of the life I have built and continue to build. A life that my first husband would be proud of. I wish I had had the chance to brag on my second husband and how that despite trials we have faced in our marriage, we are in love and good. That I feel John picked him for me because they have so many similarities, yet are each very different people. I wish I would have showed him a picture of my two amazing daughters. I didn’t though, because I allowed myself to break down and it was exactly what I needed to do, to see that I am good. I have continued to peel back the layers of my pain, revealing a trueness to myself and an outlook that is life focused. I hope that maybe I will perhaps have the chance again so I can share this part of my story. Coming out of that experience, it helped and touched my heart. Message: I remember when I used to say I was OK, because it was so much easier than explaining that I really was not. When I started crying, and I said, “I am OK,” I really meant it this time. I will always cry, sometimes sob over the loss of my first husband and best friend, but I have stopped hiding behind my pain. I am taking care of me, opening my heart, sharing who I am. I have learned that being vulnerable and real is OK. More people need to see that in this world, more people need to be shown it is ok to move past your grief and that life is a gift that none of us should waste or throw away.